This tutorial provides you with a foundation for working with copy and paste in Adobe Photoshop. It is the fourth lesson in the Adobe Photoshop CS6 Digital Classroom book. For more Adobe Photoshop training options, visit AGI’s Photoshop Classes. In this lesson, you’ll learn how to combine images while gaining an understanding of image resolution and file size. You’ll also learn about file formats and options for saving your files for use on the Web or in print. 1 If necessary, click the tab of the rooster image, ps0402.psd, to make it active. You can have many documents open at once in Photoshop, but only one of them is active at any given time. 3 Choose Edit > Copy to copy the selected image area. The image is now in your computer’s clipboard, ready to be pasted into another document. 4 Select the tab of the barn picture, ps0401.psd, to make it the active document. 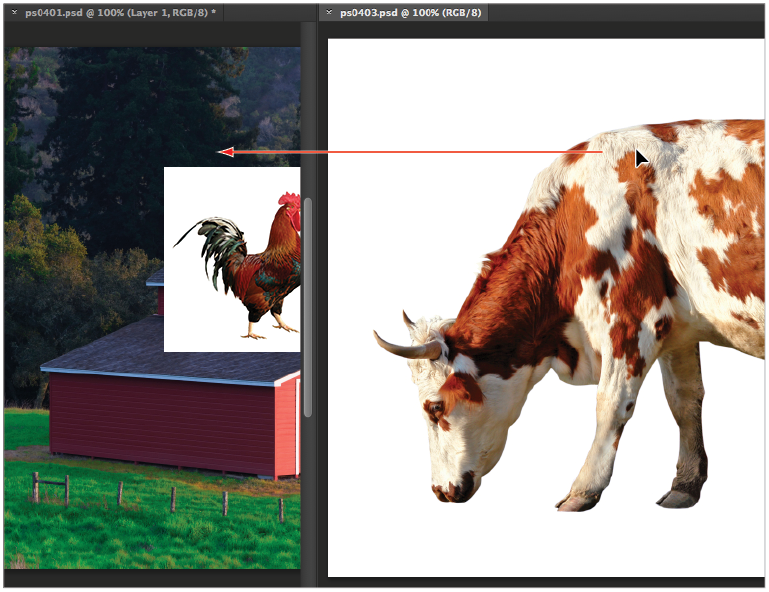 Choose Edit > Paste to place the image of the rooster into the picture of the barn. 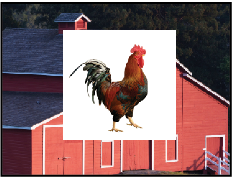 The rooster appears on top of the barn, and the background surrounding the rooster blocks part of the image. Both these items will be addressed in future steps in this lesson. the middle of the barn. 5 Select the tab of the rooster image, ps0402.psd, and choose File > Close to close the file. Do not save any changes. In this section, you’ll drag and drop one image into another. 1 Choose Window > Arrange > 2-up Vertical to view both the cow (ps0403.psd) and the barn (ps0401.psd) pictures at the same time. The Arrange features allow you to determine how windows are displayed on your monitor. The Tile features allow you to see all the open images. 2 Select the Move tool ( ), and then select the picture of the cow, which is the ps0403.psd image. Click and drag the cow image over to the barn image. When your cursor is positioned over the picture of the barn, release your mouse. The cow picture is placed into the barn picture on a new layer. Like using the Copy and Paste command, you can use the Move tool to copy images from one document to another. Click and drag the cow image into the picture of the barn. You do not have to position images beside each other to move them from one image file to another. You can also drag and drop an image to the document tab of another image, and then drag down into the image area. 3 Select the tab of ps0403.psd and choose File > Close to close the file containing the picture of the cow. Do not save any changes to the file. 4 With the composite image of the barn, rooster, and cow active, choose View > Fit on Screen, or use the keyboard shortcut Ctrl+0 (zero) (Windows) or Command+0 (zero) (Mac OS). This fits the entire image into your document window. You can also see that you have three layers in this document. The barn picture combined with the other images. The images are now layers. 5 Choose File > Save As to save this file. When the Save As dialog box appears, navigate to the ps04lessons folder and type ps0401_work in the Name text field. Choose Photoshop from the format drop-down menu and press Save. If the Photoshop Format Options dialog box appears, press OK. Although you have combined three images together, they still require some work. The background remains in the two imported images, and the picture of the cow is out of proportion when compared with the barn. Name the layers to organize them.